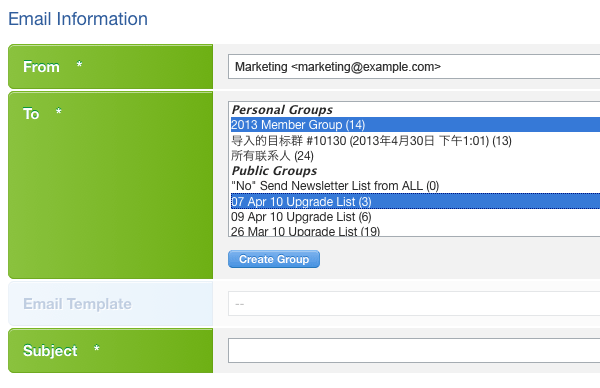 Before you send any email campaign, you should build your groups. Enter the [Campaign] section, click [Create Email Campaign] at the top right corner. Name your campaign and fill in optional [Details] for your own reference. 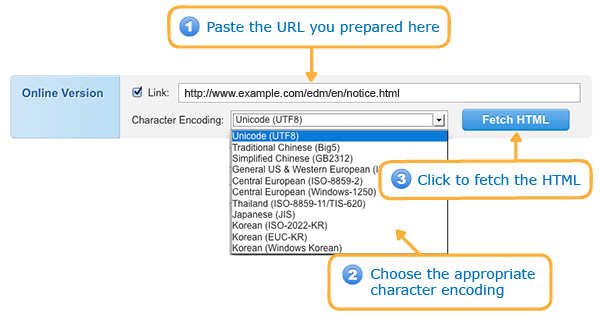 Verify if the default sender name and sender email address are correct or change if necessary. Choose your prepared [Group] or create a new one. Give a [Subject] to the email. Choose the message body format, alignment and language of pre-generated header and footer . 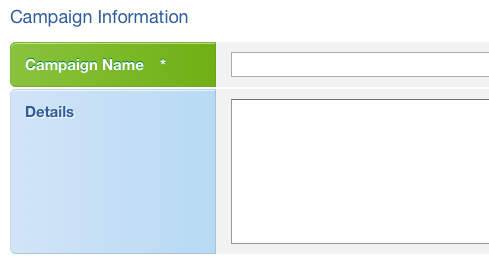 You can modify the contact information of header and footer in [My Setup] > [Email Account]. Learn more about modifying email footer. 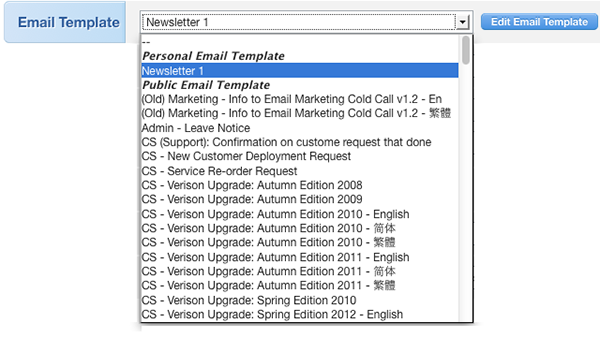 Click the [Create Email Template] button in the [Email Template] field to create a new email template. Choose from an existing email template. Learn more about how to create an email template. If someone has already prepared the content and put it onto your website as the online copy, you can grab it directly. Remember to specify its original [Character Encoding] for proper content grabbing. Otherwise, you can create HTML email in the HTML editor directly. The system provides some free templates to you. You can click [Free Templates] inside the HTML editor, choose one and add your own content. If you want, you can personalize the message with data fields. Choose field and insert its code into the right position. You can click [Spam Analysis] to do a spam check. You can modify the content according to its suggestions to avoid your email becoming a spam. Different email clients render email differently, so you need testing. Click the [Test Send] button to send a testing version of your email to your [Test Send Group]. By default, you have already been included in the [Test Send Group]. Learn more about adding contacts to the Test Send Group. Use [Inbox Inspection] to preview your email in various email clients and devices with one click. Your message will be passed to our partner [Email on Acid] to render different inbox preview images. In [Preview] page, click the [Inbox Inspection] button. You can exclude contacts, modify notifications and tune other campaign configurations by clicking the [Advanced Settings] button. When everything looks great, click Next. If there are hyperlinks in the email content, you can track clicking of them and give labels (to ease report reading) correspondingly. 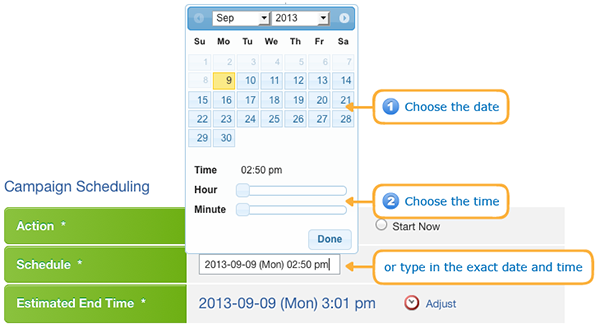 If you select [Start Now] or [Schedule], the system will estimate the end time of you campaign. You can click [Adjust] to alter the send speed and end time if you like. You can also set up [Send Periods]. Campaigns will be limited to run within [Send Periods] only or otherwise suppressed automatically. To set them up, please view: Delivery Timetable.